Stonemasons lead the movement to introduce an eight hour day into the building trades in Melbourne. The stonemasons argued that eight hours a day was appropriate in the Australian heat and would also give them time to improve their "social and moral condition". They established a national and international standard to which working people everywhere could aspire. It was widely celebrated as a world first. 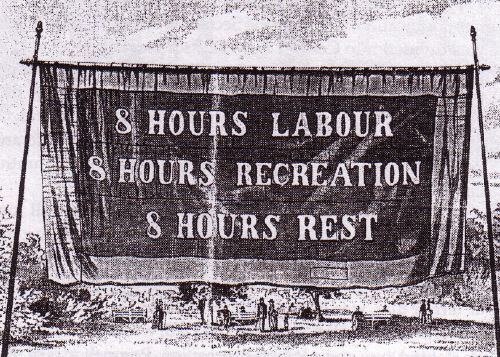 On 21 April 1856, following negotiations between building tradesmen and contractors, and with the approval of the colonial government, an eight hour day was introduced into the building trades in Melbourne. Two employers, with substantial contracts for public buildings at the Western Market and Parliament House, resisted the new working hours agreement. In response to their intransigency, the stonemasons lead a protest march from University of Melbourne to Parliament House, calling out workers at building sites on the way. Within a fortnight the contractors had given way. Melbourne's building workers, generally without loss of pay or other conditions, had gained an unprecedented widespread and sustainable victory. A procession from the Carlton Gardens to the Cremorne Gardens in Richmond on 12 May 1856 celebrated their victory. "Shortly after ten o'clock the procession, about 1200 or 1500 strong, preceded by the band, issued forth, supported by a Union Jack, with a golden figure of Eight on the spear end of the shaft." A special banner, 8 Hours Labour 8 Hours Recreation 8 Hours Rest, was launched. The procession was followed by a dinner for six to seven hundred, speeches, sports and other festivities including fireworks. The right to an eight hour day did not immediately apply to all workers, but the movement provided the impetus for other trade unions to agitate for similar conditions. As working hours reduced, workers, no longer totally exhausted, were able to engage in community, educational and leisure activities. Eight Hour Day processions were held annually on 21 April. In 1879 the Victorian government declared 21 April a public holiday. The processions became the largest public celebrations for decades, as workers marched with elaborate banners, floats and bands through Melbourne and country towns, watched by tens of thousands of people. In 1934 the Eight Hour Day was renamed Labour Day. In 1955 Moomba was introduced to replace what had begun a century earlier as a celebration of the Eight Hour Day. The Eight Hour Day monument was unveiled by surviving pioneers of the 8 Hour movement with ribbons and speeches on 21 April 1903. The design for the monument by the prominent sculptor Percival Ball is a Harcourt granite column topped with the figures 888 and a globe encircled by the words 'Rest, Labour & Recreation'.